This model is an attractive fitting for your home and showcases some of the best techniques to create complex models as good as manufactured parts. 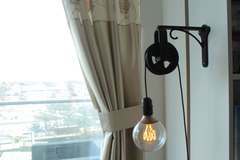 It is featured in an article on the Ultimaker website, 'End-use parts: 3D printing a decorative light fixture'. (https://ultimaker.com/en/blog/51343-end-use-parts-3d-printing-a-decorative-light-fixture) Read the blog for a step-by-step guide to the model, and more on how to design strong, end-use parts.